H&M Red Heart Sequined "I love..." Gray Sweater - $19.99 (image via H&M) because this item can take you all the way to Valentine's day and who doesn't love sequins! J Crew Metallic Jacquard Windowpane dress - $99.98 orig $228 (image via Pinterest) Honestly the photos don't do this dress justice it is perfect for going from work to cocktails to holiday parties seamlessly. I plan on paring with tights and heels or over the knee suede Stuart Weitzman's when channelling a cooler look. Take 50% with code SHOPTOIT. 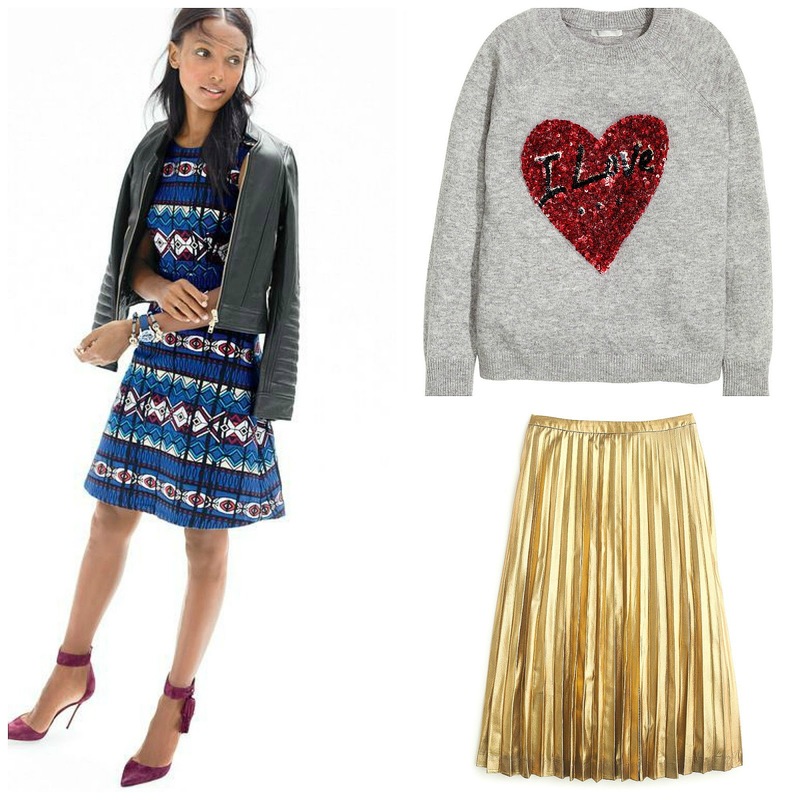 J Crew Gold Metallic Midi Skirt - $128 (image via JCrew). I have been kind of obsessed with pleated midis since spring but sadly seldom find what I am looking for. Recently I had seen metallic pleated midis in both Gucci and Intermix's ad campaigns and really wanted one. My search lead me to this J Crew option which fits the bill and is 10% of the cost of Gucci! 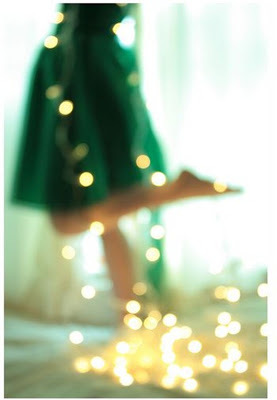 *I recommend sizing down for the best fit. Take 25% off with code SHOPTOIT. 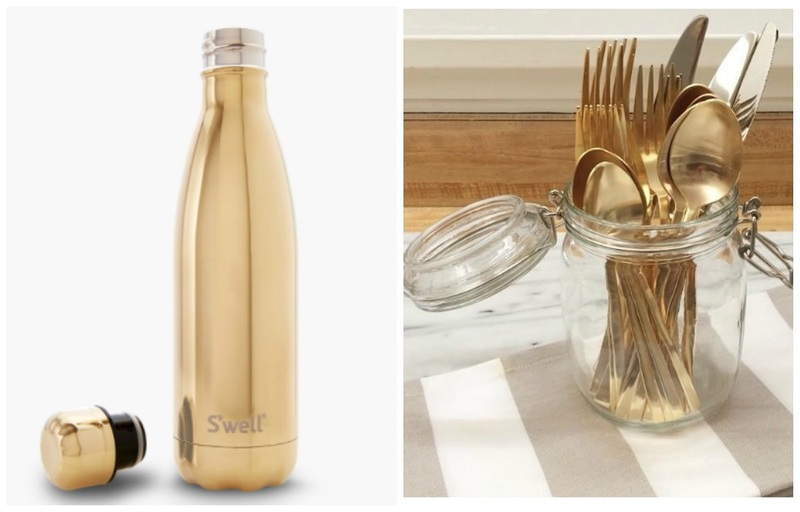 S'well Metallic Yellow Gold 17oz Water Bottle - $42 (image via S'well). I am obsessed with S'well bottles. I bought one on a whim after reading how they were perfect for transporting wine to picnics in the summer. Sadly I never used it for that and then I went to Roatan and decided to bring it along and test the whole 'Keeps your drinks cold for 24 hours, hot for 12' promise. Let me tell you it works! In practically 100 F weather I had cool water 24/7. So now my S'well goes everywhere with me and this gem right here would brighten the gloomiest of winter days. West Elm Gold Flatware Set - $31 (image via ChicGeekCC on Instagram) I have long been obsessed with adding glam to everyday moments. It just feels good and this set is perfect for entertaining or using on your own time.